This function allows you to create a label automatically. 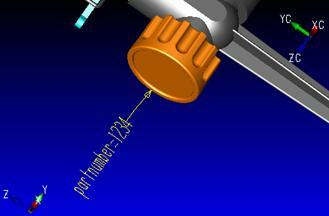 The label shows data that is extracted from a solid, a reference part or a composite. (A composite is a type of entity that you can create using Tools>Composite>Make.) The function looks at a supplied configuration file named BOMAutolabel.dat in the KeyCreator/Lang/English directory. 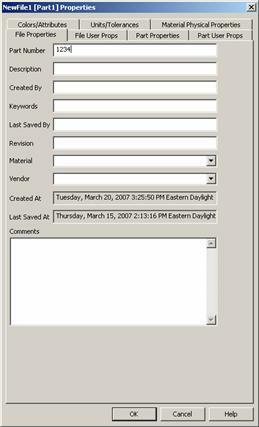 This file controls the text that appears in the label and is editable. This example uses a knob as a referenced part. The BOMAutoLabel.dat file in the KeyCreator/Lang/English folder has the following code in it: partnumber=|402$ENTID|402. Click Tools>BOM Autolabel. The Conversation Bar prompts you to select a composite or referenced part to label it. Select File>Properties and select the File Properties tab. The File Properties pane appears. Type 1234 in the Part Number field, shown below, and click OK. Now you will use the BOM Autolabel function. You select near the knob. The label appears and it is attached to the pointer. Position the pointer where desired and click again. As shown below, the label appears in the desired location. As you can see, the label reads, "position number=1234," where "1234" is extracted data from the referenced part. See Field Notes for related information.